Thanks AJ, Ray Lago turned me on to the project originally. He was a big help! 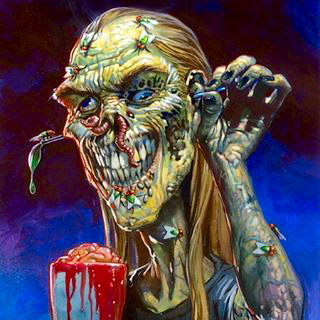 He put me in touch with Jeff Zapata and I did a bunch of Hollywood Zombies cards. I dropped the originals off in person since I rarely get to meet art directors. It was a great adventure to meet the folks in the office and picking up all the free Bazooka Joe bubble gum in the reception area. Jeff's cubicle looks like a Topps museum! I was always blown away by the creativity of Jeff and the other gag artists like Jay Cutler and David Gross. At first, they weren't sure if I'd fit with the GPK style, so I got to park the last few in the driveway, so to speak. 2. How aware were you of the Topps Garbage Pail Kids line? Were you a fan of the cards back in the 80's and were you surprised to see them resurrect again in the 2000's? I was a kid in the early 80's sticking GPK stickers all over the back of my bedroom door so my mom wouldn't see them. She'd poke her head in to make sure there were no shenanigans going on and close the door never seeing my "collection". 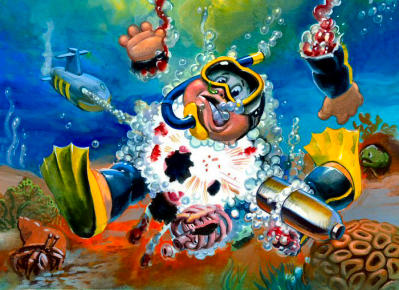 So I'm only new to the GPK scene art wise. when I first saw the four pieces that you worked on for the ANS7 set (#'s 37, 39, B1 and B5) I was completely blown away. 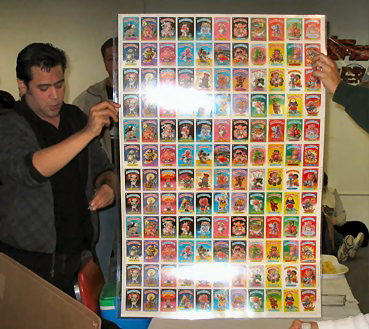 Jeff Zapata (art direct at Topps) had brought a GPK preliminary test sheet to the Philly Show in Allentown, PA (not to mention you won a very nice OS1 uncut sheet from the Topps drawing), Were you happy with the work you turned in? Wow, thanks! I'm glad you liked them. The Philly show was really cool. Meeting all these artists you've known of for years and then later sharing a beer with them was a great experience. Feb. will be framing month for me and I'll be making a special frame for the uncut sheet. I was pretty happy with the work I turned in. My favorite is the KFC spoof. I did a lot of extra planning to get the logo just right on the bucket. Logo work is not my favorite thing to do normally, but this was to be part of something bigger so I enjoyed doing it. 4. How did Zapata embrace your first 'test' pieces of artwork, were you coached very much? 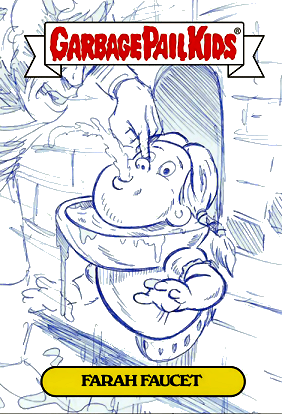 Can you share your experience delving into GPK territory? I can't say enough good stuff about Jeff. He hooked me up with a ton of past GPK cards and stickers and I just poured through them, absorbing as much of the character as I could. The style guide helped too. By the end, I was coming up with my own ideas. I never showed any because the project was over, but they're all safe in my sketch book. The first two 'test' pieces are what ended up in the bonus set. He saw I had a handle on it after the first one and gave me 2 more to do right after that. what type of style do you enjoy painting in and what materials do you use for your work? I guess you didn't see my learning curve since I was so jacked to be doing something I never thought I'd be doing. I did pretty tight preliminary drawings so I could fix any proportion problems etc. Jeff would weigh in on things and I'd do it as best I could. I work in gouache (watercolor) on 4 ply Bristol, so it's easy to tweak. 6. There's often a lot of pressure from fans for the ANS to be as John Pound-like as possible. Were you aware of this from message boards, or did you just study the model sheet in great detail? 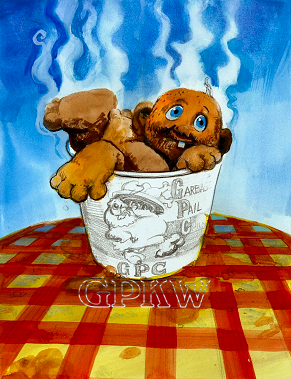 In truth, I didn't realize the whole network of people who are "in" to GPK. Living near Williamsburg (Brooklyn), it isn't hard to run in to someone who would be able to produce some kind of collectible. I was at a comedy show-and-tell show one time. People brought a little thing from home to show or just get up on mike and tell a story. Some guy passed three really thick 3 ring notebooks of GPKs around the small room and nearly stole the show! I guess John Pound is in the back of your head the whole time you work. 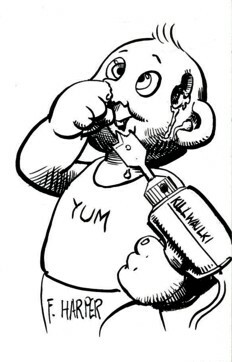 When I think of what a GPK should look like, that's it. It'll always be there, but I really liked the subtle variations and other departures from the original style. I think it'd be a great gallery show to see all these different styles in one room. 7. What type of art school experience do you have, and can you tell us about any work or other artists that inspire(d) you and your work? Where to start. I graduated from Columbus College of Art and Design in 1990 with a BFA in painting. I was originally working on an Illustration major but switched when they wanted me to do more advertising classes instead of learning to paint better. I moved to New York from Ohio within a year of graduating. I painted murals a few years then went on to Marvel and DC comics. With Marvel and DC getting conservative I was last in and first out, so I went to painting caricatures for magazines and newspapers. I put myself through college by doing caricatures at amusement parks and festivals, so it was an easy transition. So what I'm saying with all this is I've worn a lot of hats in the illustration field and have had to do a wide range of styles and subjects in the last 18 years. As far as artists I've felt influenced by, Simon Bisley, Bill Sienkiewicz, Sabastian Krueger, N. C. Wyeth, Maxfield Parrish, Lucien Freud, Goya, and aspects of a ton of other artists I see. 8. When you received the four GPK concepts to work on, did you feel obligated to stay true to the original idea/theme, or did you have room to 'toy with' or experiment with the pieces? Are you even in contact with the concept artists or just with the art director? Mostly I deal with the art director. The gags were pretty strong as they came in so I didn't think I could make it better. Sometimes Jeff would suggest something and I'd usually try t o put it all in where I could. He did encourage me to try to add more to it if I saw an opportunity. was this your idea or does the art director give a bit of direction on certain pieces? Again Jeff instigated things. He started riffing about the idea of a chicken serving chicken parts and we eat it. I was cracking up with the images popping in to my head as a result. So I brewed an espresso and did some extra drawing to figure out the best look for the logo. when ANS first rolled out, the 'bonus' cards were often the "weaker" pieces or finished artwork that didn't flow with the rest of the base set. The more recent sets have some of the strongest 'bonus' cards and are very sought after  even John Pound asked Zapata to have a card of his be placed as a 'bonus' card for this new set. Do you care where your artwork falls in a set? It doesn't really bother me. I try and get in to each card, but some ideas are really hard to fully realize given the restrictions of the size and style. So there will be cards that have some nice work going in to them, but just don't "do it" for you. That's OK we'll get it on the next one. 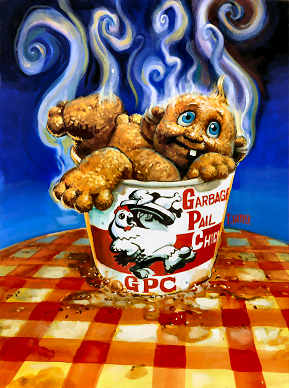 it's not often a new GPK artist is tested and revealed so quickly. How did you find yourself already seated at the Topps table line-up and drawing sketches of your work for fans? Was this your first convention, at least behind a table? It was the first GPK convention I've done. I did a few comic conventions in the past. The Society of Illustrators in New York is about the only place I ever felt I was part of an illustration sort of community. But there you meet other introverted artists like yourself and not so much a fan of what you do. Meeting Jeff in person at Topps must have kept me in mind when he was finding artists to attend the show. He put me in touch with Roxanne Toser who was helping arrange the Philly Card show. She was really helpful. When I got to the show (way too early) the whole atmosphere was nice and relaxed. I took the bus there, so they hooked me up with people for rides back and forth from the hotel and show. They even found a guy who drove in from Staten Island who gave me a ride back to Brooklyn so I wouldn't damage the uncut sheet of GPK I won in the raffle. Meeting people who were such fans for GPK was eye opening to me. You were so enthusiastic and so were a lot of the other folks that came by my table. It was a new experience for me since I usually feel like I'm doing all this stuff in a vacuum with little feedback on what I'm making. I loved meeting everybody! would you consider doing more pieces if asked by Topps and if time permitted? Man! That's so nice of you! I think Jeff has me on his list if there is another set to do. I'd do as many as he'd let me! 13. Besides work for Topps, where else can we see your work (internet, MySpace, etc.)? What other projects keep you busy? I'll get these out of the way first. fredharper.com is the caricature site and fharper.com is the fine art site and probably not work safe if you are going there! My illustration blog is Loki Loki. I'm the main cover artist for The Week Magazine in America. I freelance for a number of magazines and newspapers like New York Times, Sports Illustrated, Wall Street Journal, and many others like that. I did the art for Ozzefest '05 and designed the '06 image. I'm also starting to wedge my self into some group shows and 2 person shows for my other art that looks nothing like GPK or caricatures. It's a bit more realistic and surreal. You might say I'm pretty diversified. Things don't get stale that way.